I can't wait to get my hands on this week's book. I love re-tellings of OZ it's one of my favorite worlds. This is not the Wizard of Oz from your childhood. This is not the bright-eyed innocent Dorothy Gale as portrayed by Judy Garland. This is a story of abuse, tragedy, depression, and the lengths a person will go for the ones they love. All of your favorite Oz characters are here, reimagined in new dark and horrific ways. 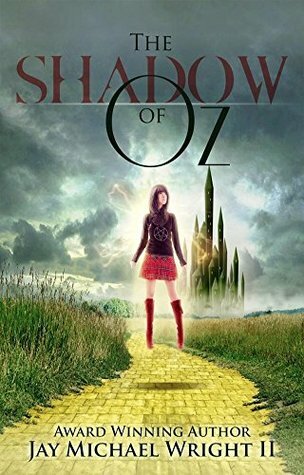 This is the story of Dorothy’s rise to power in the fantasy world of Oz, or her descent into madness after experiencing the unimaginable. Hold onto your hats, because you’re not in Kansas anymore. You’re inside the mind of the Shadow of Oz. Dorothy--A young girl with a natural talent for the dark arts who's been pushed beyond her breaking point. Is she destined to free all the kingdoms of Oz, or has she simply lost her mind? Scarecrow--Cursed with immortality, he was crucified in the Field of Blood to suffer. His torment has lasted so long, he no longer remembers his own name. He only knows what the people who come to mock him call him... Scarecrow. With fire burning behind his jack-o'-lantern eyes, he lives to serve his new master who freed him. Tinman--A magickally powered machine turned lawman. With his silver tongue and a pair of revolvers, he's always more than happy to tip his hat and bring his own brand of justice to Oz. The Lion--His people have been hunted to the point of extinction. He had never been brave enough to fight back, until he met a girl from Kansas. Jinjur--A female warrior who, in the original Oz books, led an army that overthrew the Emerald City. In this world, she's a member of the Royal Guard of Gillikin, loyal to Locasta, the Ice Empress and Witch Queen of the North. Mist Maidens--Pixies that inhabit the Cave of Time. Inside, you will find answers... or madness. Plus, many more. Come visit a world that's so familiar, yet dark and twisted into something altogether different. You'll never look at the Wizard of Oz the same way again. Ooh nice! I love a good fairy tale retelling! Hope you enjoy this one!